Im going to get straight down to business here. Last week, Kiribati President, Anote Tong announced that he was supporting a bill that would introduce the death penalty in Kiribati. This is in response to the recent killings of five women allegedly at their hands of their partner or husband. And with the Presidents support of this bill, the Kiribati Government are planning to take this to a referendum to let the people decide. Now in this blog I try to be open minded and not to shove my opinion down my readers throats, but forgive me while I break my own rules. I am pleading to every Kiribati citizen that they vote an absolute NO to the passing of this bill. 1. No human has the right to to take another life. Killing is wrong and by introducing the death penalty you are actually encouraging the idea that someone life in the hands of someone else. 2. Kiribati has a culture of men being the head of the family and the women playing a secondary role to that. For thousands of years Pacific culture has lead to men believing that domestic violence is right and a man’s prerogative. This is absolutely wrong, but it doesn’t take a bill in parliament to change a society’s ways that they have held for generations. To change Kiirbati’s treatment of women requires education over generations. Violence in the community is a hugely complex issue and the death penalty will not help this. I’m sorry to say that Tong is looking for a quick fix to difficult issue. 3. What if the wrong person is executed? Think about it. And think about all the Kiribati black magic, myths and bad luck that can accompany the people that take part in prosecuting the wrong person. Let’s not open that coconut shall we? 4. It doesn’t deter criminals. You need to educate men on how to address their feelings and to allow them to recognise their anger. Once again, this is through education. A death penalty doesn’t actually educate a community on how to address their violence issues. It just makes a spectacle out of those who kill people. 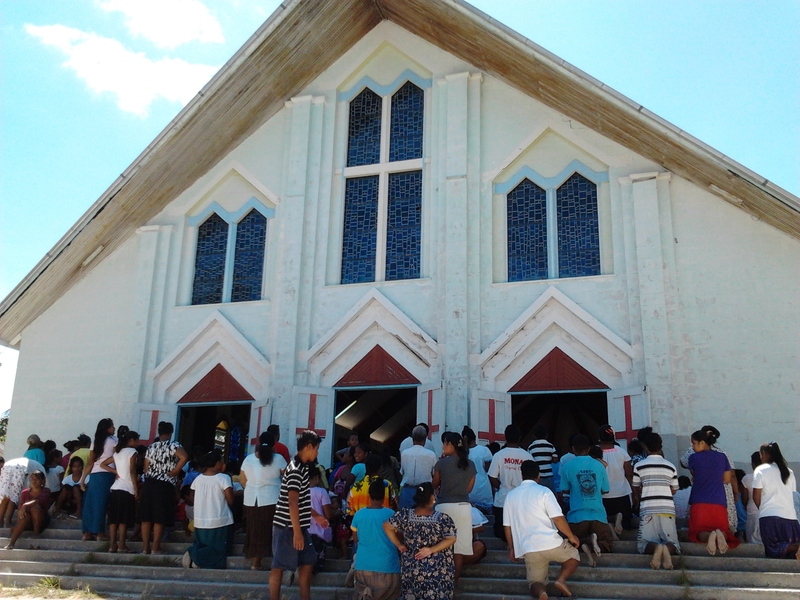 5.The Catholic church is totally against the death penalty and with half of the nation identifying themselves as Catholic and religion playing a large role in Kiribati community, we can assume that this bill does not reflect the majority’s values. I’m not one to usually announce the praises of the Catholic church but on this instance I will. Paul Mea, the Chairman of Kiribati Council of Church and Catholic Bishop has released a statement against the proposed bill and it is exactly the response I could’ve hoped for. If this referendum goes ahead, I want the Kiribati people to send a clear message; death is not the answer. Next Post Is Kiribati really relocating? Really? What a clear, well-argued, balanced case you make. I find it alarming when enlightened, democratic countries start talking about introducing a death penalty where one has not previously existed. It is too often, as you say, about looking tough on crime without actually addressing the reasons for it. Good luck with your campaign. My thoughts exactly Dani! Thanks for commenting. Hopefully this article reaches out to a few people before the referendum. How very sad! I really hope this bill doesn’t get through parliament. I totally agree with your arguments here – education is the key and life sentence penalties and counselling to the victim’s families and culture change will end violence. I am from Tabiteuea Island. Absolutely Terri. The government needs to invest more money in counselling instead of spending money organising a referendum! I am shocked that the government of Kiribati, a government that is so forward looking in many many ways, is even thinking this. You make very powerful arguments against it and I agree with all you say. I am also so glad a strong and powerful body like the Catholic Church are also opposed. Death is not the answer. Education, education, education is. I hope this does not go though. Thanks for post. Yes Marianne, death is never the answer! I’m really hoping that the Catholic Church uses it’s influence on this one – they are really important in blocking this bill!